To support all clubs with the completion of the Charter Standard Annual Health Check please find below some details in relation to the FA Licensed Coaches Club. This is relative to the below two criteria points that is currently being phased in and will display at the top of Stage 3 when completing the Annual Health Check. The FA Licensed Coaches’ Club scheme aims to raise standards in coaching across the game by ensuring that coaches keep their training and qualifications in date and up to date. If coaches meet the criteria they can become a member. The membership period runs seasonally from 1 August – 31 July. Membership of the Licensed Coaches Club gives coaches the access to a host of resources. Session plans, practices, advice, guidance and masterclasses from some of the best coaches around can help coaches deliver the best possible football experience to their players. What will coaches receive when they join the club? Access to The FA Licensed Coaches’ Club, members only website. Free access to The FA’s new coaching area, Football Coaching. Discounts off Wembley Stadium Tours, accommodation at the Hilton St George’s Park & Perform at St George’s Park facility hire. Access to official FA Licensed Coaches’ Club merchandise. In date FA Safeguarding Children qualification. In date Emergency First Aid qualification. The hours can be completed via online workshops & physical workshops that are delivered across the season all over the County and in partnership with local leagues. 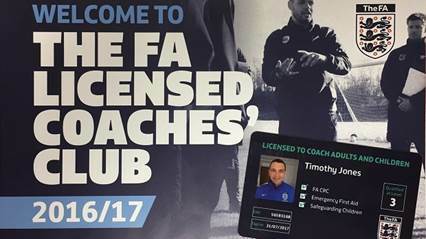 Coaches can sign up to the FA Licensed Coaches Club by clicking here and please feel free to share this post with all coaches within your clubs.